Since our founding in 1920, The American Civil Liberties Union has led the fight in the courts, legislatures, and communities to defend and preserve the individual rights and liberties guaranteed to all people in this country by the Constitution and laws of the United States. To accomplish our goals we use all tools at our disposal: public education, legislative advocacy, organizing, and litigation. Nationwide, we have over 500,000 active members and supporters, nearly 200 staff attorneys, thousands of volunteer attorneys, and a network of affiliate offices in every state. In Michigan, we have grown to over 22,000 active members and supporters since we were formally established in the state in 1959. As one of the top affiliates in the country, we have 27 full-time staff who are attorneys, lobbyists, communications specialists, organizers and administrative personnel. The ACLU of Michigan has a presence across the state with our headquarters in Detroit and offices in Lansing, Grand Rapids, and Flint. To get started, please complete our volunteer form if you have not already. 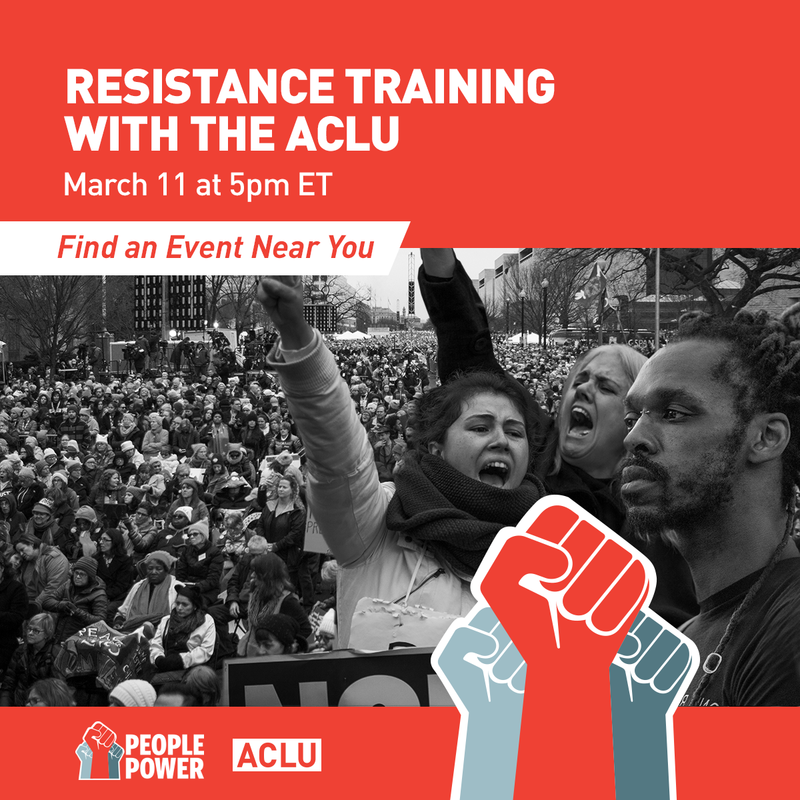 On March 11, the ACLU held a Resistance Training. The event launched People Power, the ACLU’s effort to engage grassroots volunteers across the country and take the fight against Donald Trump’s policies not just into the courts, but into the streets. Visit the People Power website to learn the next steps you can take to organize in your community or to find an event near you. We have assembled a few resources to assist in learning more about the ACLU of Michigan and the issues we work on, identifying opportunities to get involved, and directing interested volunteers in the advocacy that is essential to bringing about change. Write a postcard to your state senators and representatives about issues impacting Michigan residents - and how you’re going to continue to fight for them in the weeks and months ahead. You can send them alone or consider inviting some friends, neighbors and family over for a postcard party. You can make a tremendous difference by committing to join with the ACLU of Michigan in making our voices heard - clearly, consistently, and loudly. We know that face-to-face meetings, telephone calls, and letters make an impact. Reach out to your neighbors and friends to organize regular contact with your local and state elected officials and the ACLU of Michigan will provide you with resources, materials and support. Our goal is to reach every member of Michigan’s Congressional Delegation and convey the importance of protecting and preserving the civil rights of all Americans, and to remind them that their constituents care deeply about civil rights and will vote in 2018! Volunteers interested in protecting the rights of immigrant, refugee and Muslim students and their families have an opportunity to help ensure that schools remain welcoming places by encouraging their local school district to issue Plyler statements of support. If you have any questions about the resources provided, please e-mail ACLU of Michigan Field Director, Rodd Monts: rmonts@aclumich.org.